NEW YORK (CNNMoney.com) -- After more than a year of effort by its advocates, President Obama signed the Wall Street reform bill into law Wednesday, promising that the measure will put an end to taxpayer-funded bailouts of failed banks. "Because of this law, the American people will never again be asked to foot the bill for Wall Street's mistakes," Obama said in a ceremony at the Ronald Reagan Building in Washington. "There will be no more taxpayer-funded bailouts. Period." Among its many provisions, the law also attempts to shine a light on complex financial products called derivatives and creates a new consumer protection agency that will set rules to curb unfair practices in consumer loans and credit cards. "These reforms represent the strongest consumer financial protections in history," Obama said. "And these protections will be enforced by a new consumer watchdog with just one job: looking out for people - not big banks, not lenders, not investment houses - in the financial system." 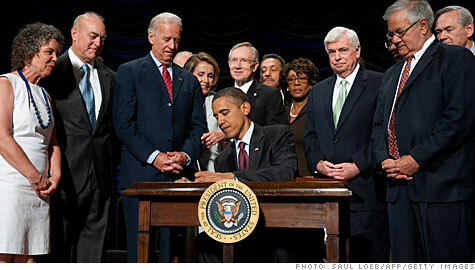 At the signing, Obama was flanked by a number of lawmakers who worked on the legislation, including Sen. Christopher Dodd, D-Conn., and Rep. Barney Frank, D-Mass., the two committee chairmen who sponsored the bill. Elizabeth Warren, the Harvard law professor considered a leading candidate to run the consumer protection agency, was among the President's 400 guests on an invitation list to the ceremony. Also invited were Vikram Pandit, the chief executive of bailed-out Citigroup, and Bob Diamond, president of British lender Barclays.